Ben has sent us some great photos of a great collection. There are countless ways to display action figures but the one that always stands out is a room with rows and rows of figures on matching bookcases and shelves. It’s a work of art really. Ben started collecting roughly around the time of the Star Wars Special Editions and his first figures were Darth Vader, Boba Fett and Bib Fortuna: all from the Power of the Force 2 line. He mainly collects 3.75 inch figures but his Gentle Giant mini busts collection is another huge passion for him. Most recently he has been getting interested in Star Wars Black Series figures and as he tells us, “my collection is growing rapidly.” He is also a big Marvel collector. For more great photos from his collection, follow Ben on Instagram. How large is your Star Wars room? It's 11 X 15. We moved last September and we got a finished basement with two bedrooms. My wife was gracious enough to let me have one for my collection. Do you have a particular collecting focus? Not exactly. I have always been a huge fan of all things Star Wars, Star Trek, Indiana Jones, LOTR etc... I had all my original Kenner figures and a few play sets from when I was young but had them stored. I would see figures show up on the shelves and would get a few random ones here and there. Usually a Han Bespin figure in some form. About 5 years ago, I was talking about how I never got the Millennium Falcon as a kid and my wife bought me the Lego Falcon. I put it together quickly and got addicted to Lego Star Wars for a while. Got about 2 dozen sets including the Death Star, big super star destroyer etc... I started to display them. Then I got my older figures out. Then I got the 6" 40th anniversary figures. And then, and then, and then… It just took off from there. My best friend never stopped collecting and is my partner in crime on toy runs. So I went nuts for a while grabbing anything I could find. Now that I have the bulk of what I have been looking for I am starting to narrow down. I would like to get my hands on every Han Bespin figure. He was my favorite figure growing up. So that's what I've started to narrow down on. The “counter”-style glass cabinets look really nice. Where did you come across them? How do you decide what to put in them? Actually they are shelving units you would buy for a garage or basement. They are 48" wide and 24" deep. They don't have glass (yet) but are really sturdy for displaying. I ran LED strips along top and inside to illuminate. I found them at Sam's Club. One box gives me two shelving units. You have the capability of where you want the shelves. They are black on black. Which helps as most the room is black and grey. What to put where is always a work in progress. I am consistently re-arranging and moving things to dust and clean. That's playing for adults. As I add more I make more room or re-arrange. You backed the barge! What are your initial thought on it and have you found a permanent spot for it or will it stay on the counter top? The barge is fantastic. Honestly, it was well worth it. I look at it as a ready made Diorama piece. It's so detailed and just ... big. I went back and forth about backing it but am so glad I did. It's truly a centerpiece. I have it set up where I think I want it. For now. LOL! I kinda have the cabinets set up as Star Wars on the left, Empire in the middle, and Jedi on the right. I rearranged the figures in the cases above to correspond. You’ve used baseball bat display cases on either side of your TV which looks very impressive lit up. The Kenner card back-style backgrounds are another great idea too. Where did you find them? What are the Death Star wall backgrounds that are between each case? Someone posted the baseball bat displays on the Toy Run Facebook page which I am part of. My friend and I came up with mounting them just enough to put figures in and in between. I added more LED strips and I just printed some of the kenner style cardback designs on Photo Paper and cut them to size. I think it turned out well. The Death Star backgrounds I got from Diorama Workshop. They are also printed on photo paper. I did laminate those just to give them a little more sturdiness. We don’t normally “hock The Trek” on The Sandcrawler but we’ll make an exception because your collection is impressive! It’s obviously much smaller than your Star Wars collection so how have you decided what to collect from Star Trek? I also grew up a big fan of Star Trek. I’m a huge fan of the original series and the movies and Next Generation as well. I started by collecting main crew, then got a few more, and ended up buying a lot from Facebook of about 90 figures. I really like the playmates line. Really good sculpts. Also, the Diamond Select figures from the original series movies are fantastic. But spendy. With Star Wars seemingly sticking around forever do you have a plan to continue collecting? Not really a plan per se. There a few elusive things I really want. The Vintage Collection Slave 1 and the Legacy Falcon but they are really expensive. I am really enjoying what they are doing with the black series 6" line. The new face printing technology is awesome. Especially on Tarkin and Dengar, right? (The best in the series -ed.) So I don't see me ending on those anytime soon. As far as 3.75, I'm sure the new movie will give us some more goodness. Not a huge fan of the VII and VIII but loved Solo and Rogue 1. Also, the Vintage Collection line. I don't have the completest mentality so I don't need everything from every line, I collect what I think I would like. I want everything to have a story. Something has to have meaning for me. I like just looking at them and knowing why I have that figure. Also, listening to your love of the POTF2 line is getting me back into wanting those. (Sorry, not sorry. -ed.) I didn't collect those at that time. Broke college kid. So I definitely see me adding those first and second waves. When I have friends over they all like hanging out down there. We watch Retroblasting and Fwoosh videos and just talk about collecting in general. It's definitely my escape. 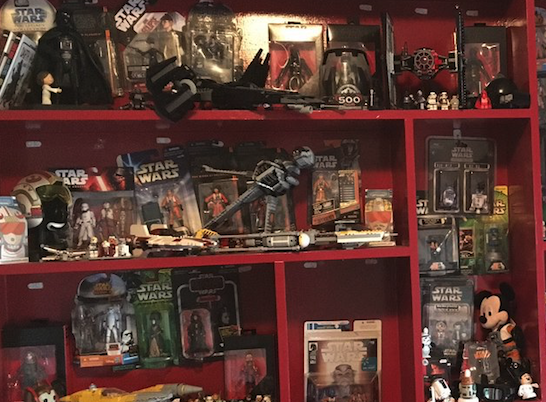 Dave Fronsee’s Star Wars collection is in a room attached to a larger rec room (where Star Wars has managed to spill out into based on the fireplace mantle). The doorway into his collection reminds us of what Walt Disney did first with Disneyland which is to have a visual “weenie” to entice the eye as one approaches. The doorway frames the collection in just such a way that you see a good part of it, but not all of it. But instead of Sleeping Beauty’s castle (or Cinderella’s Castle, or the entrance to the soon-to-be-opened Galaxy’s Edge) we see a large part of his collection on the other side of the entrance. It draws us in and makes us want to explore. And what a collection to explore! Dave has managed to fill nearly all existing wall space with various types of shelving ranging from IKEA simplicity to cubicles, to small shelving units that he says were scavenged from rummage sales. Each shelf is roughly themed: Boba Fett figures filling a small 4-step shelf, a short floor display filled with Star Wars Sequel figures and vehicles and one wall almost filled with white cubicle shelving. He’s got stuff everywhere…even in the closet. The room contains two closets but instead of holding clothes Dave has installed shelving inside of both of them and removed the doors. This way he’s able to display even more of his collection and the lights inside the closet help highlight the items on the shelves. It’s a genius way to maximize display space and we’re jealous. Dave has been a contributor to our site before, check out his family vacation across the country featuring Funko POP minis. We had the distinct pleasure of welcoming Matt Cardona, AKA “Zack Ryder” from the WWE to our show and had a blast talking about Black Series, vintage and of course, Power of the Force 2. Zack sent along a few photos of his Power of the Force collection and his unique way of displaying them: in his closet. After Zack talked with us he had to head out on the road but promises to send photos of the rest of his collection. Be sure to check back! We know we’re a little biased at The Sandcrawler when it comes to the Power of the Force (POTF2) action figure line from the 1990’s but we have to say that this awesome collection from Garry Wright just makes this line of figures shine! Check out his custom cabinets and custom LED lighting system. Garry says it was easier to do than it looks and will share his process with us. When you think about it, lighting can really make or break a display and in Garry’s case, his figures just…shine. We have featured the collection of Rex On Leave before but now he sends us photos of what might be the most fun Christmas display ever! Oh sure there are ornaments and figurines that some us may pull out for the holidays but Rex goes next level with his Christmas Clone Wars display! Check out the photo album below and be sure to follow Rex on Instagram. 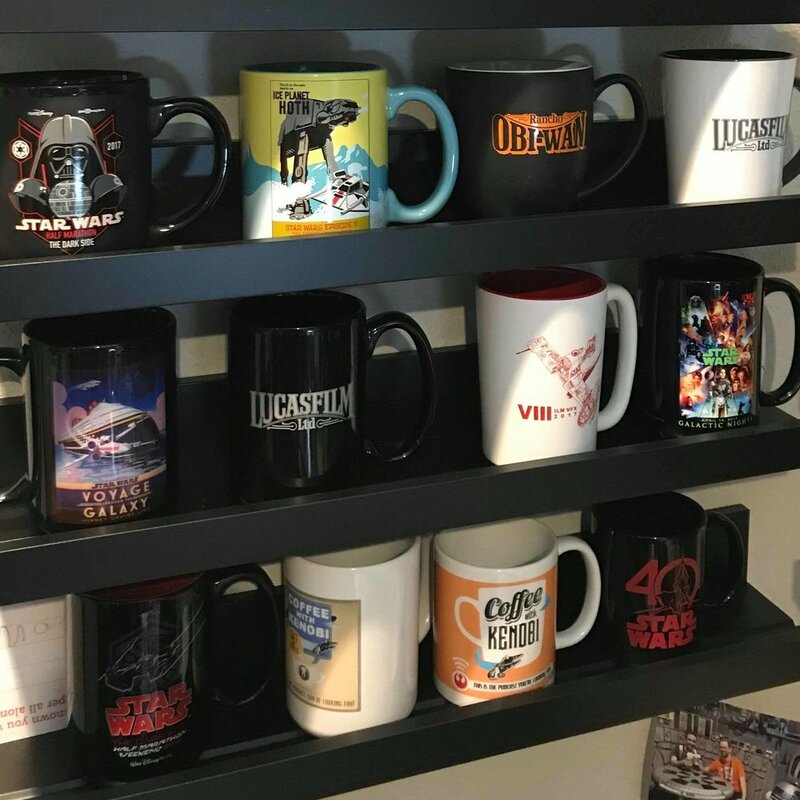 Dan Zehr, co-creator of Coffee With Kenobi, has experienced some amazing Star Wars-related events over the years and his Star Wars collection reflects that. 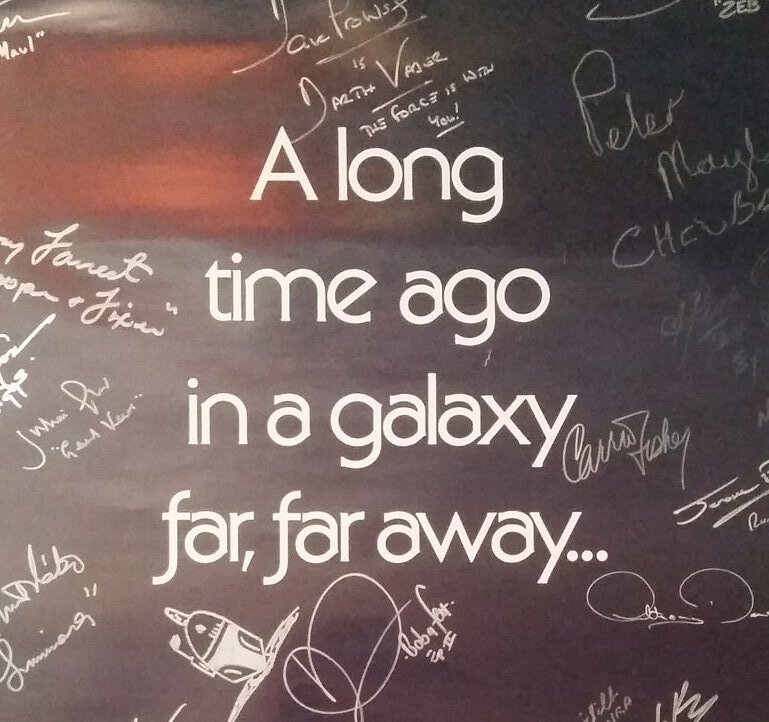 It also reflects one man’s fandom that began at a drive-in theatre back in 1978. 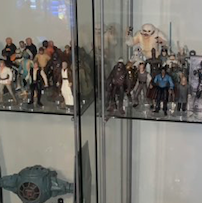 From exclusive merchandise that he has picked up while visiting Lucasfilm and Skywalker Ranch to a display of his original Kenner figures, Dan’s collection shows just how long his Star Wars journey has been. You can listen to Dan along with Aaron Harris of Coffee With Kenobi’s Resistance Reactions below. In it they talk about their collections as well as a discussion on favourite Disney Parks merchandise. I have mentioned a few times that I had a rather large collection that I sold years ago. The photos were lost, or so I thought. I just found a cd buried within my music cd's that has most of those photos. I have been rather bummed about the loss of the photos, let alone the actual collection. The Force is with me today. Once again, my collection was just pure pandemonium in it's placement. There's a story behind that. 1. How long was it between selling your original collection and then starting the process of rebuilding it? 2. Are you collecting the same way now as you did back then? 3. If not, what are you doing differently as a collector now? 4. Were there items in your original collection that you just HAD to replace? I wanted to give you a little background before I answer the questions. I feel like it gives some context to the collection. First, I was born in 1975 and as a kid I didn't get a lot of Star Wars toys. There were things I always wanted and never got. So, in 1996 at the age of 21 I noticed a lot of the Power of the Force in stores and I'd buy a figure every so often. I was also engaged at the time. Fast forward to 1998, the marriage is not going well, and every time I come home with a new toy I hear the complaining, “Why are you wasting money", etc. The toys get released for the Phantom Menace and I buy a few items. We separate at the end of 2001 and then Attack of the Clones hits theatres. Now I'm single and I'm gonna show her. Haha! I buy EVERYTHING I see. From toys to shampoo to bandaids. I'm getting signs from Taco Bell and banners from Toys R Us. I was on the road daily so I stopped at every Wal-Mart or Toys R Us I passed to fill holes in my collection. I was obsessed. This went on through Revenge of the Sith in 2005 and my house looked like a toy store had exploded. Let me tell you, when you are 30, single and ready to mingle and you have a massive Star Wars collection, you better have some game. Anyway, a point came when I met my 2nd wife who was very supportive of my hobby, that I realized I was just over the collection. I was moving and didn't have anywhere to store it anyway. So, I took pictures and sold is as a whole collection on Craig's List. Way too cheaply, btw. I kept a few of my favorite items, but not many. Just in the last 4 or 5 years have I started to rebuild. 1)There was about 6 years in between selling and rebuilding. 2) The way I collect has changed drastically. I can not afford to just buy EVERYTHING anymore. Nor do I want to. If I see something I think is cool, I'll grab it. But I'm selective. 3) I'm much more limited on space so I will pass on things if I am not really drawn to the item. 4) There were a few things I regretted selling and wanted to replace. I loved the comic 2 packs. I got all the ones I had back thanks to a friend. He had actually bought them from me and just gave them back. I had numerous Millennium Falcons, boxed and open. I have replaced one which is enough. And I absolutely loved the Unleashed figures. I believe they were about 6". I had all if them and miss those. Thanks for sharing Jamie, we’re pretty sure this has happened to many adult collectors. 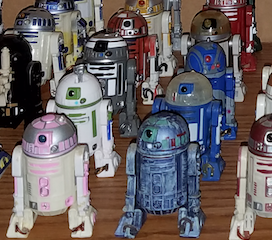 Whether it’s that big garage sale in the 1980’s where our parents sold our “Star Wars stuff” to financial situations or broken marriages, many collectors can sympathize with giving up or losing collectibles that at one point were important to us. Always in motion is the collection to paraphrase a wise Jedi Master. Jordan Maison, Editor in Chief of Cinelinx.com was in our Collector's Spotlight way back on Episode 9. On that show he spoke of his love for all things Darth Maul. 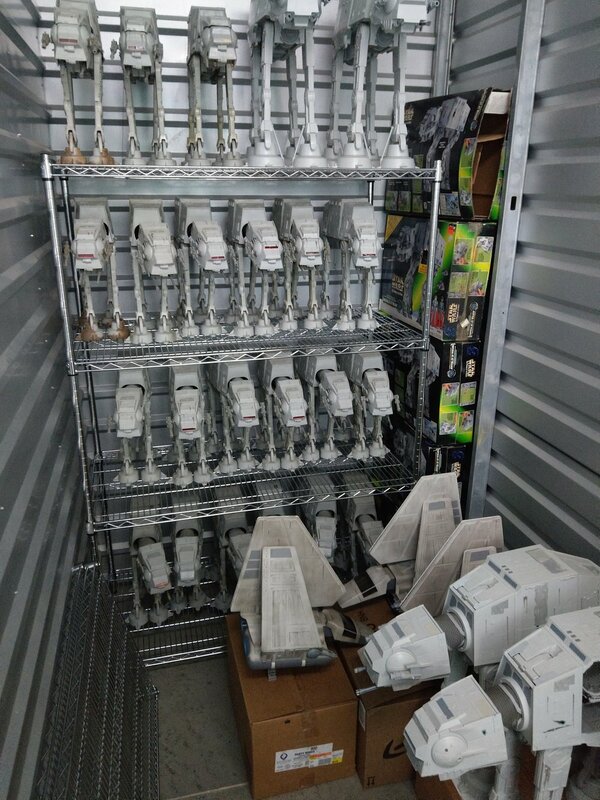 Recently Jordan was tweeting about his collection and we asked him to share his photos on our Spotlight page because TheSandcrawler.net wasn't actually in existence back when he was on the show. Darth Maul is definitely one of those iconic characters who's distinctive look makes him ideal for a collecting focus. 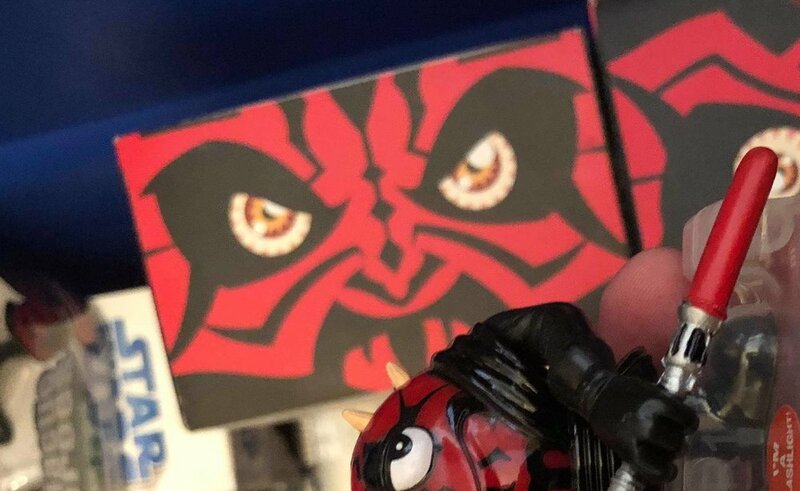 Of course the fact that we first saw Maul during the Phantom Menace days, with it's tons of merchandise, doesn't hurt either. Great collection, Jordan! Share more photos when you're able to take some of these items out of storage! Paul is a long-time collector who is very passionate about how Star Wars movies are made and enjoys the behind the scenes books. He also has a large collecting focus on magazines. The Power of the Force line has a special place in his collection and some of the highlights are in the photo below; including a Japanese C-3P0 and a "square card" Stormtrooper card from Canada. We really like Paul's use of IKEA's Detolf cabinets. The glass towers positioned side by side are a stunning focus in his Star Wars room and their glass shelves are divided by character. A very focused, very tidy way of displaying a collection. Just take a look at his Luke X-wing pilot collection! A few framed animation cels and storyboards help show the history and the making of the films and along with his extensive book collection clearly show his love for how Star Wars is made. "As I was taking pics, I realized what a mess it must look like. But, I have limited space and this is what it looks like. It makes me happy. Most of my 'prized’ stuff is in my fiance and my bedroom. 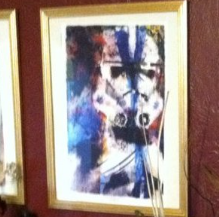 The Vader and Stormtrooper helmets are in the living room. Then, in my shop it is just madness. All my moto stuff is in there with overflow Star Wars and some G.I. Joe. It's just where ever I make room. Of course my race helmets are my favorite. They are one of a kind. 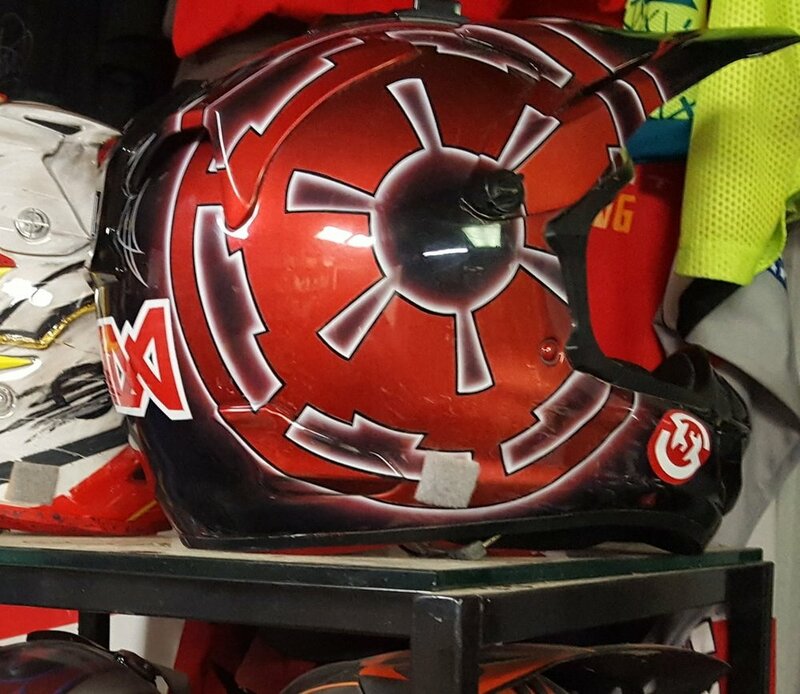 And both motorcycles have custom Star Wars logos." Yoko is one of the four hosts of the Funko FunKast and is part of the marketing team at Funko. She was our guest on Episode 43 where apart from deciding that Boba Fett is a chump, we had a fun discussion about how we display our figures and collectibles. What we love about Yoko's displays is that they're full of bright colours (she's a Disney fan so that's just going to happen). She also groups a lot of her figures by colour which adds a real focus to each shelf: you can't help but be drawn to them. One really cool trick that Yoko employs is to use the packaging of some of her unopened figures as a way of adding height and levels to her shelves. Listen to our talk with Yoko below! Feast your eyes on the might of the Galactic Empire! "Rezikai" definitely has a love for all things Imperial, especially in action figure form. Say what you want about the good guys of Star Wars but let's face it, the Empire has the "cool factor" cornered! your collection? Is it your main focus? The Empire does indeed make up most of my collection, I've always loved the imperials of the original saga trilogy like Tarkin, Piett, Veers as well as EU imperials such as Mara Jade and Thrawn etc. I'd say the Imperials are my main focus moreso by default as my focus is imperial army building. I love the uniformity of the military with the fearsome look of the imperial troops. The Death Star panels in the background of my pics are two seven piece sets from a very professional seller known as the Galactic Trading Post @GTP-Toys (twitter) who make them as a interchangeable set of walls in both 3.75" or 6" scales. I know Dan's not an opener but the quality of these space walls may make him change his mind. These are professionally done from a plastic manufacturer in the same kind of tough ABS plastic similar to Legos... bare-foot destroying as known by parents around the world. Is there a reason for the large amount of Biker Scouts and Death Star Commander figures? Large amount of Bike Scout and Death Star Commander figures you say? ... I take issue with the term Large... they are but a small incling of the truly vast resources, power and might of the Galactic Empire... lol. But seriously I orignally (and still do) plan to do a diorama of the Emperor's arrival on the DSII. That scene had lots of biker scouts, imperial army troopers (At-St driver looking guys) and lots of Imperial gunners and Imperial officers. So i decided to add in more Death Star Commanders... as Imperial Naval troopers to stand across from the Imperial Army troopers (At-St guys). Also because they are awesome to kitbash a few customs using a Juno Eclipse for female versions and a more recent 3.75 Black series version that was a slimmed down blonde haired trooper giving some variety. large vehicles? It would make for a killer display! Large amount of AT-AT's you say? I take issue.. hah no. I know it's a lot. There's a reason for it. I actually started my army building with AT-AT's first long ago before realizing it was easier on my wallet to army build figures. The original reason I got into an AT-AT focus to begin with is a story frommy fandom during "The Dark Times" after Return of the Jedi but before the EU resurrection with the Thrawn trilogy. It comes from the old Star Wars West.End.Games RPG module books and the tactical diagram books that gave detailed inventories of Imperial, Rebel and other ship. That my friends and I played campaigns with. In particular an Imperial Star Destroyer had 20 AT-AT's and 30 AT-ST's (had to wait to get the AT-ST's on the $15 clearance price last year). But back in those days we kids were fighting for scraps of new Star Wars content until the books rekindled the Star Wars fervor, so we used vintage figures with our RPG games until POFT2 launched (we didnt care for the 1" plastic miniatures). When POTF2 did launch, my friends and I saved money and slowly started to pick up a new POTF2 AT-AT almost every paycheck from our crappy high school fast-food jobs. Together we had an objective to make the full Star Destroyer compliment of AT-AT's. We got close,.. 14 before we lost sight and started to grow out of the old RPG and figure collecting. My friends gave me theirs as they decided to become respectable adults and for a while I did to. I returned to Star Wars a few years ago after leaving during the prequel era to do the adulting thing. Pulled the AT-AT's I had out of storage and decided to finish the run of 20 in honor of my friends some 20+ years ago. What is your favorite Star Wars figure line? Favorite Star Wars figure line... thats darn near asking me which of my children I love more. Most people that know me would think I'd say "The Vintage Collection" or "The Legacy Collection" because I love super articulation. However I don't so much prefer a line over the other as I prefer a good figure over another. For instance the POTF2 Ishi Tibb I prefer as he's never been redone, or Tessek from POTJ is another figure that comes to mind, nor the 2nd best scoundrel in the galaxy Bo Shek from the POTJ line. I guess if it comes down to a figure made multiple times in Super Articulation it would come to my secret love... good accessories. A good accessory will make or break me on a decision when it comes to a figure. For example the 3.75 Black Series/Vintage Collection Slave Leia with her staff and neck chains are fine but the Legacy Slave Leia with the alternate pair of legs will get my choice. Do you dabble in 6 Inch figures? I do dable in 6" figures, but it's very rare. I only have a handful Kanan, Ahsoka, Hera, Sabine, Thrawn. I loved the rebels characters and since their only SA versions were 6" I picked them up. Except the Thrawn I got the SDCC exclusive one with all his accessories from the show as I mentioned I love good accessories. Other then those I don't mostly because I've always been a 3-3/4 guy. More power to the 6" collectors though, that new dewback looks awesome. "My son took these when he was about 10 years old (and) I think it really showcases the power of pretend play, and that some kids are still very much in love with hands-on imagination. I included a candid shot of him at the time, and another from recently." "He's now 16 and still loves Star Wars just as much. He is also a talented saxophone player, a very creative writer, and good communicator. I think a lot of that was inspired by his long hours of this type of play!" Yup, you read that title correct. Let's let Paul fill us in. He writes, "Hi Guys, I'm Paul from Cambridgeshire, UK. I have my own Star Wars dining room...how I ever talked the wife into it I'll never know lol!" Clearly Mrs. Smith should be nominated for "Wife of the Galaxy!" His incredible Han in Carbonite piece was purchased "from a very talented guy called John from Whitby in the east of the UK, He makes these as a hobby, he casts, paints and makes the frame which is illuminated by LED lights, I have installed a rechargeable spot light above so I can change the color and effects by remote control, so it makes it more of a feature piece!" The three crossed lightsabers that are mounted above his Stormtrooper display are the “room or nightlight” versions, the only down side to these is that they do switch themselves off after around 15 minutes which is not ideal… but they do come with a remote control." One element that stands out in Paul's dining room is the different types of bright colours that just make everything in the room stand out. From the yellow/orange walls to the multiple lightsabers with green, red and blue blades to the ominous lights coming from the Han in Carbonite the entire collection just shines. Thanks for sharing with us Paul! 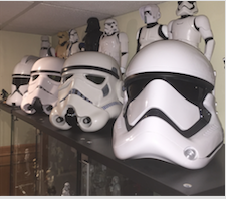 -April 2018: Paul sent us a few pictures of his updated Stormtrooper display that now includes an awesome AT-AT Pilot helmet! Matthew's collection is just amazing. White cabinets and shelving to highlight his action figures, and a table overflowing with Lego are exactly why we love featuring collector's Star Wars rooms here on The Sandcrawler but there's something else about this collection we can't quite put our finger on. Oh wait! That's right, it's the GIANT green shrine to everyone's favourite Rodian and one of the Original 21 Kenner Star Wars figures: Greedo! Kermit the Frog said, "it isn't easy being green" but clearly Matt's collection doesn't have the same problem. Not only is green the primary colour when we think of Greedo but in this display, the hapless bounty hunter who NEVER GOT A SHOT OFF at Han Solo is literally framed in green lights. 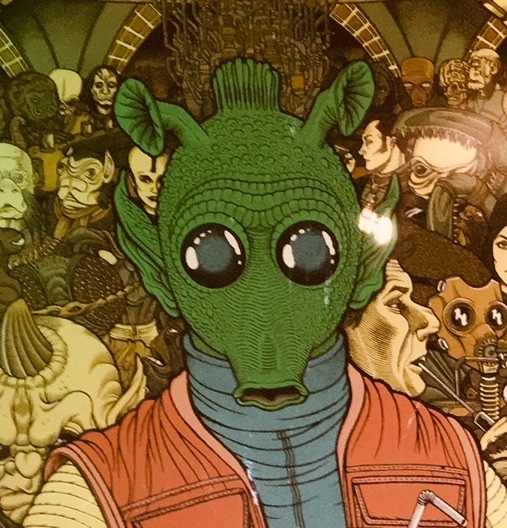 Matthew has a variety of Greedo figures in this display and what we especially like about it is the two large prints featuring Greedo and those glassy eyes, staring down at effigies of himself. If you have a particular passion for a particular character, be like Matthew and be BOLD! There is so much to love in the collection of Derek Spier of Raising Fangirls. Let's start with the choice of shelving, namely the bright red bookcase. More and more we're beginning to realize how important the colour of the furniture used in displaying our collections. Regular woodgrain just doesn't do the action figures justice but a vibrant red? It just makes the toys look that much more fun! And Derek's choice of a bookcase with randomly placed cubbies just adds to the funkiness and fun of the display. He's made good use of his carded figures as background pieces on some shelves which helps add different colours throughout. There's a definite focus on the Rebel Alliance in his collection (which suits me just fine-Mac) but there's a also a lot of smaller focuses, like the wide shelf full of Empire-themed figures and the one cubby full of Disney Parks merchandise--see the Raising Fangirls website for lots of Disney content. Also fitting then, Derek's collection also favours items with a "family" feel: The statue of Darth Vader being hugged around the leg by a young Princess Leia (inspired by the "Vader's Little Girl" series) is a lot of fun. The final two photos in this Collector's Spotlight are of what Derek says is his most expensive item in his collection. He is currently modding his car into what he's calling his X-wing, "Jaina." We can't wait to see how it turns out! 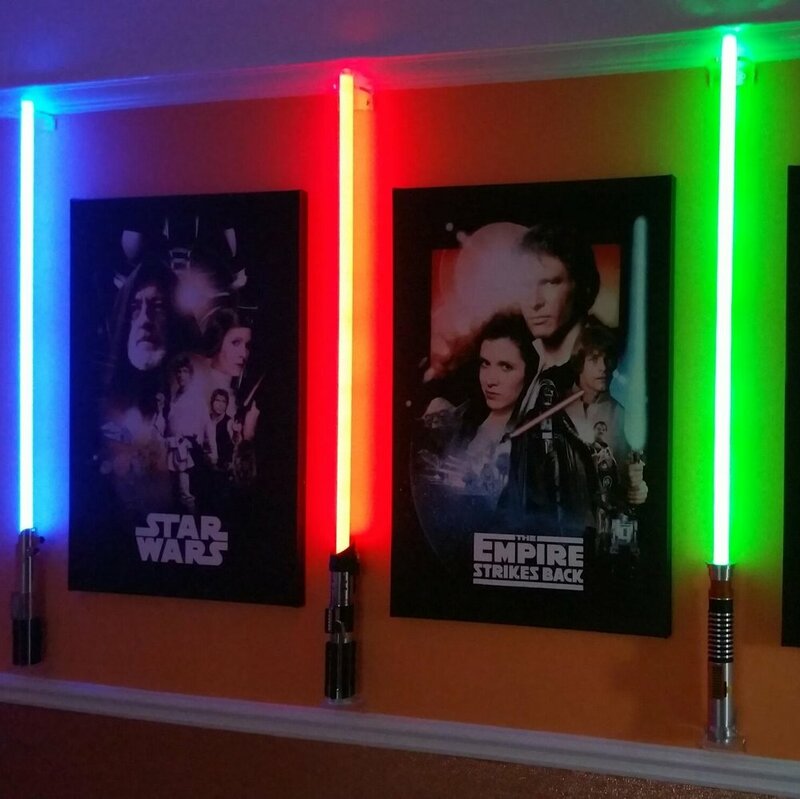 So many different ways to display the Star Wars things we love. Whether it's a small focus on Itty Bittys, books or a combination of carded or loose figures, there's never one "right" way to display. Thanks to everyone featured here for giving us a taste of how you collect! Thanks to: Erin Gaudette, Hasan Scarborough, Michael Nipp, Nigel Cox, Stephen Chopchik and Woodrow Hull! If you would like to see a part of your collection featured in these highlights, send a photo to SANDCRAWLERPODCAST@GMAIL.COM. Every saga has a beginning. Mac's co-worker, Erin has only begun collecting recently. Funko POPs are her focus and her new IKEA bookcases are already filling up. Love the ROTJ print btw! One thing we really love about Bryan's collection, apart from all the awesome Stormtrooper helmets, is how he uses so many types of shelving in order to pull his various displays together. Whether it's glass IKEA shelving for larger pieces or a baseball bat display case for his Kenner figures, each display stands out from each other. It's an eclectic mix of props, figures and vehicles that also includes carded Stormtroopers from most of the history of Star Wars action figures. We reached out to Michael on his awesome Instagram account when he posted a collage of his action figure photography, He was kind enough to share the full-sized photos with us and we are thrilled to present them here! Michael told us, "Here is a little of what I call MY "action figure therapy." 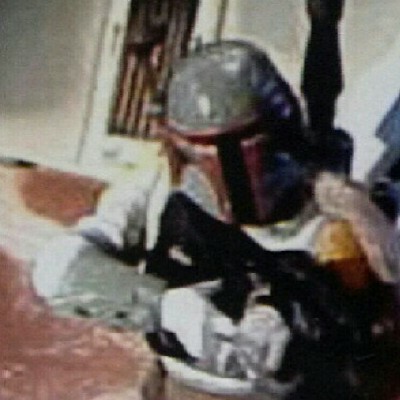 He then mentioned that the Boba Felt photo was taken in the late 90's and wasn't, "one of his best." Well, it looks pretty darn good to us Michael! 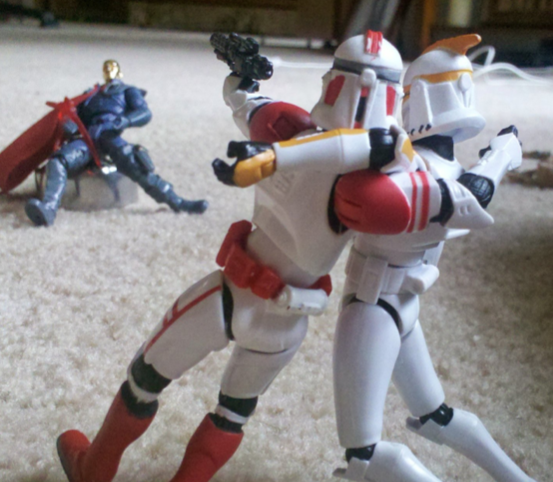 Thanks for sharing some action figure therapy with us! 2-IS A VERY NICE MIX OF STATUES, HELMETS, TOYS AND PRINTS. 3-IT'S A REALLY GREAT DISPLAY THAT IS HIGHLIGHTED BY THE PRINTS IN VARIOUS LOCATIONS THROUGHOUT THE ROOM. INSTEAD OF LARGE POSTERS DOMINATING THE WALLS, THE SMALL FRAMED PRINTS GIVE THE ROOM A LESS CROWDED FEEL THAN YOU MIGHT EXPECT. IT'S A WELL THOUGHT OUT USE OF VARIOUS TYPES OF SHELVING TOO. WHEN AND HOW DID YOU FIRST SEE STAR WARS? PERHAPS MY EARLIEST MEMORY IS OF HAN SOLO BEING FROZEN IN CARBONITE. I WAS THREE, AND I BELIEVE THE SHOWING WAS AT A DRIVE-IN IN CALIFORNIA. WE ALSO HAD A BOOTLEG VHS OF A NEW HOPE THAT HAD BEEN SMUGGLED OUT VIA SOME INSIDER CONNECTION WHEN WE LIVED IN HOLLYWOOD. I THINK WE ACQUIRED THAT TAPE AS EARLY AS '78 OR '79, AND I WATCHED THAT VERSION THROUGHOUT THE 80'S. IT HAD WARBLY SOUND, NO EPISODE IV CHAPTER TITLE, AND WOULD FUZZ OUT DURING THE SCENE WHERE THE DROIDS ARE HIDING IN A MOS EISLEY DOORWAY, SO I DIDN'T EVEN KNOW THAT SCENE EXISTED UNTIL ABOUT ’92. DO YOU HAVE A FAVOURITE STAR WARS FILM? DEFINITELY THE EMPIRE STRIKES BACK, FOLLOWED CLOSELY BY A NEW HOPE AND THEN THE FORCE AWAKENS. I FIND VALUE IN ALL OF THEM, BUT THOSE THREE ARE DEFINITELY TOPS. I HAD ALMOST BOUGHT INTO THE IDEA THAT NOSTALGIA OR EXPECTATIONS WERE, APART FROM QUALITY, PREVENTING ME FROM ENJOYING A NEW STAR WARS FILM AS MUCH AS I DID THE ORIGINALS, BUT EPISODE VII REALLY BLEW THAT CONCEPT TO BITS. I LOVE IT. AMONG ITS MANY OTHER QUALITIES, I JUST FIND EMPIRE TO BE SO WELL LIT. I DIG GOOD LIGHTING. DID YOU COLLECT ACTION FIGURES AS A CHILD? YES, BUT I WAS NEVER A STAR WARS FIGURE COLLECTOR FOR SOME REASON. I WAS REALLY INTO G.I. JOE, HAD THE AIRCRAFT CARRIER AND EVERYTHING. YOUR COLLECTION IS AN AMAZING MIX OF BLACK SERIES 6-INCH AND SH FIGUARTS. WHAT IS IT THAT DRAWS YOU TO THIS SCALE OF ACTION FIGURE? I LOVE THE BUMP IN DETAIL AND PRESENCE YOU GET OVER THE 3.75-INCH LINE, WITHOUT (IN THE CASE OF HASBRO AT LEAST) TOO MUCH OF A PRICE HIKE. I THINK DEEP DOWN I ALSO PROBABLY LIKE HOW THE SCALE IS RELATIVELY VEHICLE FREE, FOR OBVIOUS REASONS OF SIZING. IT'S KIND OF CLARIFYING AND SELF-LIMITING. DO YOU HAVE OTHER FOCUSES? DO YOU COLLECT 3.75 ALSO OR JUST THE LARGER SCALE? I HAVE A SMATTERING OF FIGURES AND VEHICLES FROM THE LATE 90'S POWER OF THE FORCE 3.75-INCH LINE, RIGHT UP UNTIL THE PHANTOM MENACE CAME OUT, WHICH KIND OF KNOCKED THE COLLECTING URGE OUT OF ME FOR A GOOD LONG SPELL. MY CHILDREN HAVE FREE REIGN WITH THEM NOW, AND I'VE BOUGHT A FEW MORE FIGURES & VEHICLES IN THAT SCALE SINCE, ADDING AN A-WING, A NABOO STARFIGHTER, AND AN EPISODE III JEDI STARFIGHTER (LOVE THAT DESIGN) TO THE MIX. I TRY NOT TO GET TOO PRECIOUS ABOUT THEM, AND REALLY VIEW THEM AS TOYS. YEAH! MY SIX-INCH COLLECTION IS AT WORK. I WORK IN FILM RESTORATION, AND THESE GUYS ARE ALL RIGHT OVER MY DESK. IT'S REALLY NICE TO GLANCE UP AND MEDITATE ON THEM WHILE I'M SOLVING THE DAY'S PROBLEMS. THE STEPPED RISERS ARE TWO TELESCOPING SPICE RACKS FROM THE CONTAINER STORE. BEFORE I GOT STANDS FOR EACH FIGURE, I HAD A REAL PROBLEM WITH THEM FALLING DOWN, AND SPECIFICALLY FALLING BACK BEHIND MY DESK, SO I HAD THE IDEA OF CONNECTING THE BOX INSERTS WITH THAT CLASSIC IMPERIAL LIGHTING PATTERN IN ALTERNATING BLUE AND ORANGE ALONG THE BACK SO AT LEAST THEY WOULDN'T TUMBLE BACKWARDS. I INITIALLY TRIED TO LIGHT THE SPACE WITH ADHESIVE, AAA BATTERY POWERED TOUCH LIGHTS ALONG THE TOP, BUT KEEPING THE BATTERIES CHARGED PROVED TO BE A NUISANCE. I FOUND INEXPENSIVE ADHESIVE LED STRIPS ON AMAZON THAT PROVED TO BE A GOOD LENGTH AND COULD PLUG INTO THE USB PORTS ON MY WORKSTATION FOR POWER. I CAN CHANGE THE COLOR FOR ADDED MOOD, BUT MOSTLY KEEP THEM A RATHER NEUTRAL BLUEISH-WHITE. IS THERE A METHOD TO HOW YOU’VE CHOSEN TO GROUP THEM? STORIES YOU’RE TELLING? A HIGHLIGHT FOR US IS HOW YOU’VE RECREATED THE SCENE FROM ESB WITH VADER, LANDO AND FETT—IT LOOKS AMAZING! I LIKE TO KEEP THEM FAIRLY CHRONOLOGICAL MOVING LEFT TO RIGHT, TO CHART THE VISUAL DEVELOPMENT OF THE SERIES, BUT AS I REFRESH THE SPACE TO ACCOUNT FOR NEW FIGURES I OFTEN CHOOSE SOME NEW INTERACTION FROM THE FILMS THAT I PARTICULARLY ENJOY TO REPRESENT IN THE SPACE; THE THREE-WAY PHANTOM MENACE DUEL, KRENNIC AND HIS DEATH TROOPERS, VADER'S UNMASKING, FINN VS. FN-2199, OR AS YOU SAW RECENTLY, THE HALLWAY SCENE FROM EMPIRE WITH VADER, LANDO, AND FETT... ONE OF MY FAVORITE SCENES FOR REASONS OF COLOR, LIGHTING, AND THE CHARACTERS INVOLVED. THERE ARE JUST A TON OF FIGURES IN THESE PHOTOS. DO YOU PLAN ON “COLLECTING THEM ALL” AS THE SAYING GOES? OKAY... SO THE FORCE AWAKENS CAME OUT, AND I WAS INSPIRED TO PROCURE REY, AND MAYBE OLD HAN. THEN I WAS LIKE "I'LL JUST ROUND OUT THE MAIN CREW" AND GOT FINN. THEN, WITHOUT GETTING TOO POLITICAL, THE CAMPAIGN OF 2016 STARTED GETTING ME DOWN, AND THIS ALL SPIRALED INTO SOME SORT OF RETAIL THERAPY. AS IT STANDS NOW, YES, I'M COMMITTED TO BEING A COMPLETIST IN THE BLACK SERIES SIX-INCH LINE (APART FROM THE VEHICLES, MOUNTS, AND LARGER SCALE MONSTERS). FIGUARTS BLOWS ME AWAY BUT MY INTEREST IN IT EXTENDS MAINLY TO THE PREQUEL CHARACTER RELEASES THAT I SEE NO INDICATION HASBRO WILL BE GETTING TO ANY TIME SOON. WHAT ARE SOME OF YOUR FAVOURITE PIECES IN YOUR COLLECTION? FIGUARTS MACE WINDU AND MULLETED OBI-WAN ARE JUST ACES. 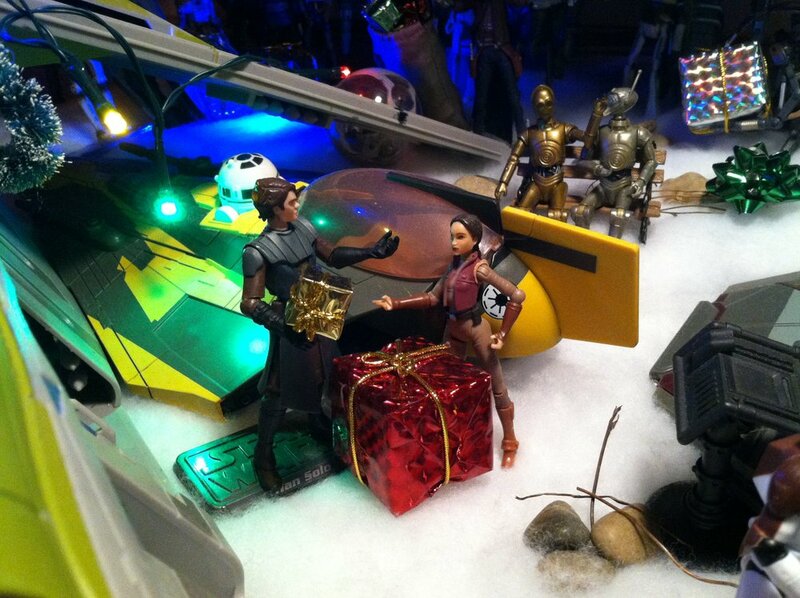 I'M ABOUT TO OPEN THEIR ATTACK OF THE CLONES PADME AS WELL, WHICH I'M REALLY EXCITED ABOUT. HASBRO CAN BE UP AND DOWN, AS I'M SURE YOU'RE WELL AWARE, BUT I FIND ALL THEIR ARMORED STUFF TO BE REALLY ON-POINT, AND PARTICULARLY ADMIRE BOTH THE ESB AND TFA SNOWTROOPERS FOR SOME REASON. I LOVE THE "REALISTIC" TAKES ON THE CARTOON CHARACTERS THEY'VE GIVEN US WITH SABINE, AHSOKA, KANAN. ALONG THOSE LINES I'D LOVE TO SEE A VENTRESS FIGURE, AND I'M CURIOUS TO SEE WHO TAKES ON THE VENERABLE COUNT DOOKU FIRST... HASBRO OR FIGUARTS? X-WING LUKE IS ALSO A GREAT LIKENESS, A CLEAR EXAMPLE OF HASBRO PUTTING THEIR BEST FOOT FORWARD. BAZE AND CHIRRUT ALSO FEEL LIKE STANDOUTS AMONG RECENT RELEASES. THE 40TH ANNIVERSARY VADER GIVES REALLY GOOD EPISODE IV VADER, BUT I FEEL LIKE NO ONE'S NAILED THE EMPIRE STRIKES BACK VADER IN THIS SCALE YET. MY LEAST FAVORITE RELEASES IN THIS SCALE WOULD HAVE TO BE A TIE BETWEEN THE LEGENDARILY SHABBY POE DAMERON IN HIS FLIGHT SUIT AND FARMBOY LUKE, THE LATTER OF WHICH THEY MIGHT BE ATTEMPTING TO RECTIFY IF THE PREVIEW PICS OF THE UPCOMING LANDSPEEDER-ACCOMPANIED VERSION ARE ANY INDICATION. THANKS FOR SHARING YOUR AMAZING COLLECTION WITH US SETH! FOLLOW HIM ON TWITTER! 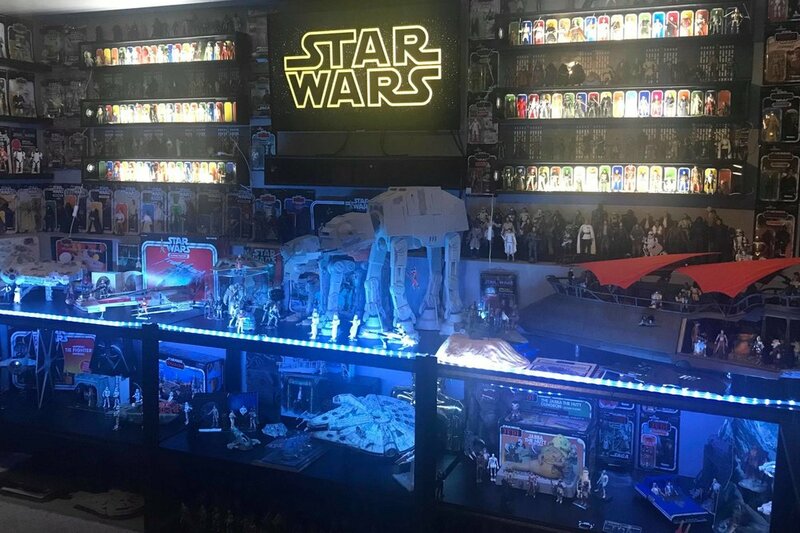 "@rexonleave" tweeted these photos of his collection to us with the comment, "How to properly decorate your china hutch and wine bar for star wars fans. ;)". We especially like how the ahsoka tano and Captain Rex prints look great next to the shadow box of miniature vehicles!